ONE OF A KIND "DUO" TODDLER SLEIGH TO TAKE THOSE PESKY MULTIPLES OUT FOR A SNOWY STROLL IN THE NEIGHBORHOOD OR THE LOCAL PARK. 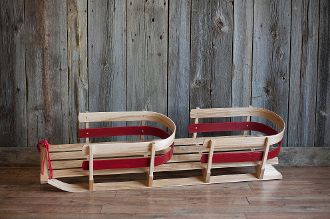 THESE CLASSIC ST.NICK TODDLER SLEIGHS ARE NO STRANGER TO THE MOUNTAIN TOWNS OF BANFF AND MT. TREMBLANT EITHER. A STAPLE OF EVERY DAY LIFE IN THEIR CANADIAN HOMELAND, THESE SLEDS ARE AS IMPORTANT TO WINTER AS WARM MAPLE SYRUP AND CANADIAN BACON.